This entry was posted in Art, Art-house Cinema, Movie Reviews, Movies and tagged Adventure, Beethoven, Beethoven's Seventh, Catinca Untaru, Fantasy, Independent Films, Justine Waddell, Karen Haacke, Lee Pace, Seventh Symphony, Silent Films, Stuntmen, Tarsem, Tarsem Singh, The Fall, Vanity Project. Somewhere, Susan Sontag just cracked a smile. Thanks for the review! Wonderful review David and what an amazing pic. Definitely will have to see The Fall. Hi Dave, I was wondering if you knew exactly which piece of Beethoven’s 7th was used in the movie. I couldn’t make a strong enough mental note when the credit was rolling up in the theater. Regarding the movie, I very much enjoyed it – pretty much everything but the “dream sequence” which seemed out of point relative to the entirety of the movie. It’s the 2nd mvt of the 7th symphony. Oh and I saw this movie before I read your review and for the past 4 days now, all I’ve been doing, as sad as this may sound, is read reviews on the movie. It’s such a surreal feeling to have seen a movie so grossly satisfying that I need confirmation that it really is as good as it was and that I didn’t inflate the emotions because of what happened that night. I wondered whether the night made the movie better or if the movie made the night. As exciting as it is to find the prospect of love, it’s even more exciting to find a film whose merits lay solely on the intrinsic value of a movie and not on the monetary scale, which is the street standard judge of a film’s success. 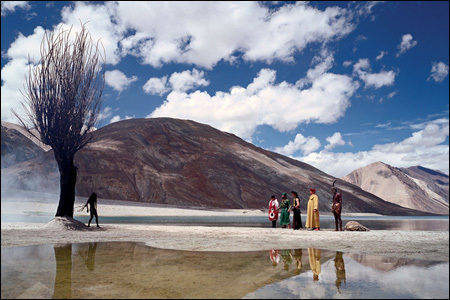 Tarsem’s “The Fall” revolves around the friendship and contrasting personae of the suicidal stunt man (Pace) and the adventurous little immigrant girl (Untaru). This motif of contrasts is carried out through the entire film as you will discover beautifully twined transitions from somber gloominess to a flood of colors, dull mumblings resembling terrible acting to captivating stage-like performances, youth and innocence to the harsh realities of cruel life, and, most importantly, the ultimate antithesis: to be or not to be. The range from simple to grand so tightly packaged in this wonderfully served feast of a movie makes even the highest grossing films need more ketchup. So happy to be back in the blogosphere and I see you have some great work that I need to catch up on. I saw Tarsem’s quasi masterpiece and have the same feelings. I loved the transitions, which you rightly highlight as some of the films best moments. My critique would have to be with the story. I had no sympathy for The 4. As cute as the little girl is, Lee Pace isn’t really the greatest guy to have tell a story. So I’m in philly for about a month or so before I leave for film school. Want to catch a movie at the Ritz? I’ll be back to your blog to read more reviews. Thanks again! It wasn’t just the Beethoven that made this movie so memorable. The soundtrack, in general, is outstanding. So far, I can’t find a CD of the soundtrack. Is there one? Can anyone help? So, there must be a music list of smth? But I didn’t see one. Can we find the music list on our own? does anyone know what the other classical music is who wrote the classical music, the name of it, the movement ect. in the movie the fall? but i just cant find any of the other gorgeous classical music from the movie. so if anyone has any helpful information that would be great!